Who’ll play me in the film? In my last blog post, I mentioned that I managed to get a line in what I’ve now discovered is a chaotic poem. The poem then went on to being displayed in John Rylands library. The downside (there’s always a downside) was that I wouldn’t get to see the poem up as it would be taken down by the time I’d returned to Manchester for Easter. On the morning I was travelling back to Manchester, I rang the library, on the chance the poem was still up, only to be told it had been taken down. Sad face. Only joking, despite being told previously that it would be taken down by the end of March, it was still up. 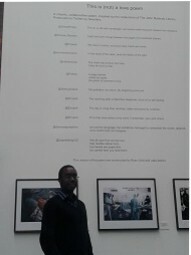 So on my return to Manchester, the first thing I did, was go to the John Rylands to see my words up on a big wall. To coin a phrase used regularly by broadcaster Danny Baker, “It’s the feel good story of the year”. All that remains is to decide who’ll play me in the film of this story. In the past I’ve been told I look like Kanye West and Puff Daddy, so maybe one of them?